I am really looking forward to the Stitch Gathering this coming weekend and have nearly finished the homework I need to do. Maybe you remember this? This is the bag which is also an entry ticket, and the idea is to decorate it for your secret partner. I have been staring at it on and off, waiting for inspiration - for a while I kept thinking of a quatro stagione pizza, but I'm not sure if anyone would appreciate that on their bag! This is it now. This is the front. 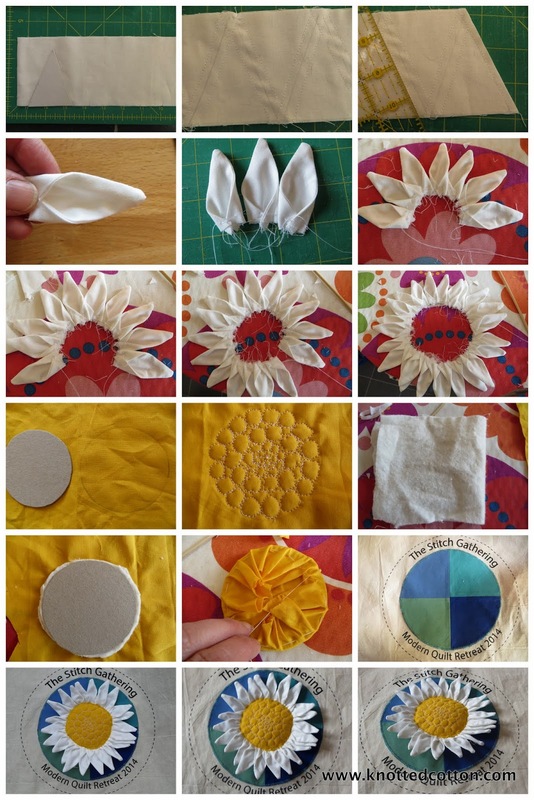 The centre of the daisy is FMQ'd with two layers of batting and is also sewn over a small wodge of stuffing to pad it. The petals are made in the same way that I make speedy bunting flags, and I folded the bottom corners in and then threaded them together to hold the folds and gather them into shape. The flowers and leaves are fused into place, then zigzagged round the edges (flowers) and free motion embroidered (leaves). The stems are satin stitch (close zigzag on my machine). I lined the bag with Ikea curtain lining fabric which was almost a perfect match. I had already had to unpick the side seams and open out the bag in order to decorate it, so I cut a piece of lining the same size as the opened out bag plus a turnover allowance along what would become the top edges. I folded and pressed this allowance down, then with the bag opened out flat and with wrong sides together I sewed the bag and lining together close to the top edge. I then folded the bag back up (ie bag shaped, handle to handle) right side out and lining inside and zigzagged down each side before turning inside out again and sewing a straight line outside the zigzags, thus making French side seams. Among the dumber things I did was fusing my blue-green circle to the bag before sewing the daisy on, which made the daisy very, very hard to stitch in place. One day I hope to get to the stage of being able to make things without it being a learning experience! That is so so sweet & pretty & fresh! What a lucky partner! I think I'd fold under the pressure to make something beautiful enough. Look forward to reading about the retreat! So pretty and your FMQ pebbles are amazing, wish I could get mine like that. See you on Sunday! Oh....I think that we will never reach that finishing line without oodles of boo boos along the way. Your bag is quite simply delightful. Love, love, lurve that flower. Have a wonderful weekend filled with good fun and lovely stitching! Your bag is absolutely beautiful. I love all the details that you added to it. I'm sure your partners will appreciate all the effort and creativity you put on it. Have a great time. looks brilliant, a lucky secret partner. 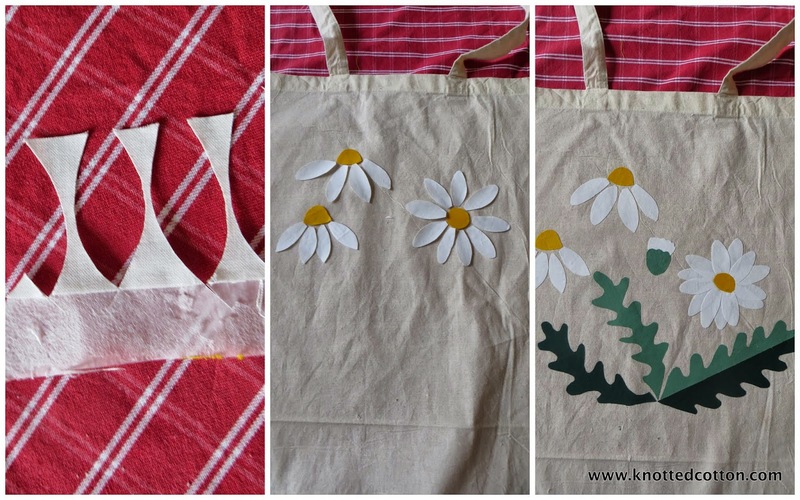 the daisies front and back are wonderful and a great idea to line it. I'm with you on the learning experience, I suppose that is why posh dressmakers use a toile and practice first! Looks great! I don't think anyone could be disappointed by pizza though! What a great result! Had to laugh, often the most difficult thing is getting the steps in the right order. So many times I've made life hard for myself by getting it wrong. Just gorgeous - serious admiration going on here! Fabulous bag--very creative daisy on the front! Such a fantastic bag and thanks for the step by step photos! Getting excited now and can't wait to meet you!! it looks fantastic :-) Have a wonderful weekend! Those daisies are so great! I love the texture of them, they all add such a nice focal point! Such a pretty bag, Catherine! There is something happy and airy about daisies, they do brighten up everything around. I am sure your secret partner would love this sweet bag. Beautiful bag, I especially love your quilting and the way you've done the petals for the 3D effect. Have a great time this weekend.